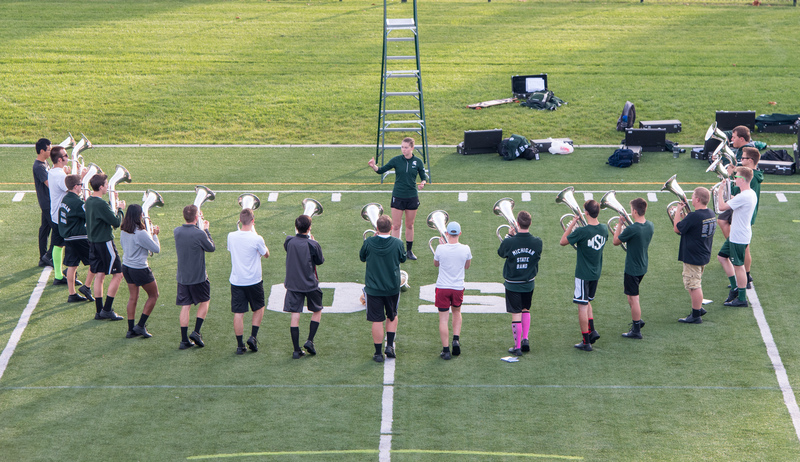 The Spartan Baritone section is comprised of eighteen dedicated members. 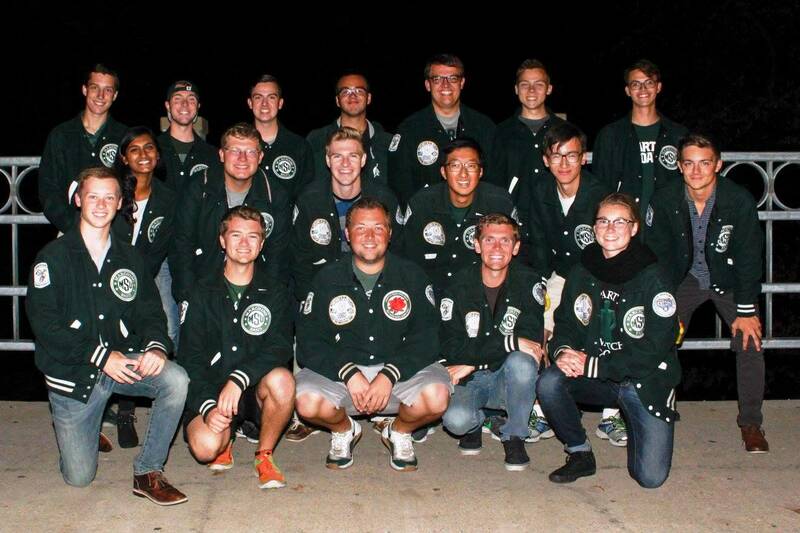 As one of the smallest sections in the band there is a true family-like connection among the group. The section is led by section leader Alyssa Wauldron, and squad leaders Jacob “Pancakes” McCormick, Kevin Eccles, Mark Elinski, and Jacob Topp. 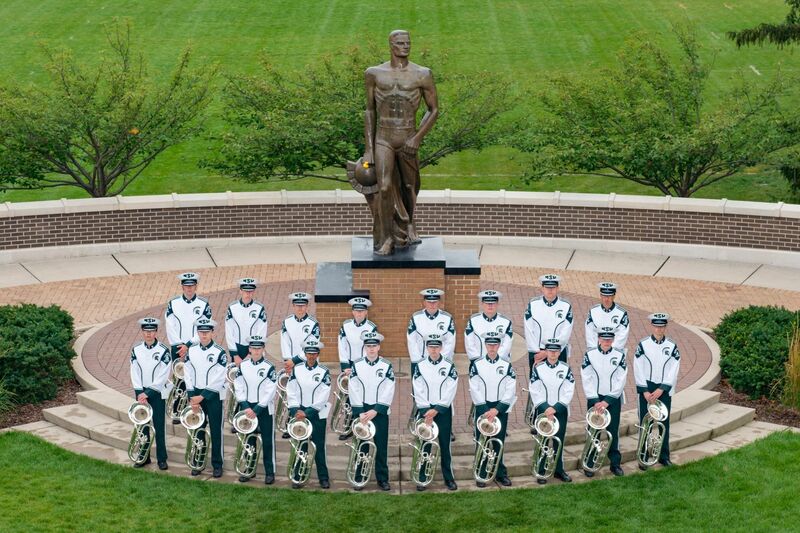 Each section in the Spartan Marching Band is divided into squads, a four or five person marching unit. The Baritones make up squads 39, 40, 41, and 42 of the 54 squads in the SMB. Academically, the section represents eight different colleges at MSU: the College of Engineering (7), College of Agriculture and Natural Resources (3), College of Natural Science (2), College of Music (2), Lyman Briggs College (1), the Broad College of Business (1), College of Social Science (1), and the College of Communication Arts and Sciences (1). Five members of the section are in the Honors College. 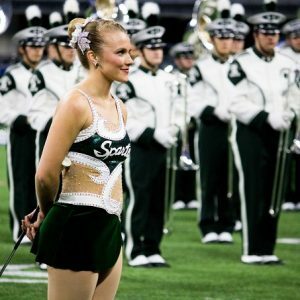 History and tradition are at the core of the Spartan Marching Band and are certainly a central component to the Spartan Baritones. The section has a storied history and numerous long-standing traditions of its own. 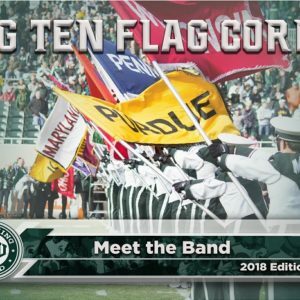 The Baritones are particularly connected with the greater history of the SMB and Leonard Falcone, the beloved father of the MSU Band. Falcone was director of bands from 1927 through 1967 and was a world renowned virtuoso on the baritone horn. 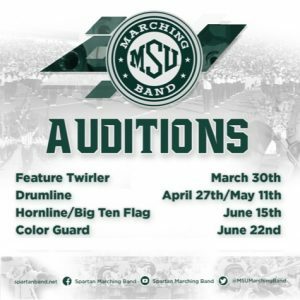 Take a listen to the MSU Shadows and you will hear a beautiful weaving baritone line penned by Falcone to showcase the warm low brass tone of the instrument. Among the section’s most well-known traditions is “Hooah.” In 1988, the section was looking for something unique to put on its section shirts. Baritone squad leader Jim Starkey, who was also in ROTC, suggested “Hooah” as a possibility. The word is a military battle cry and slang for the “best of the best.” The section adopted “Hooah” that season and it caught on very quickly. 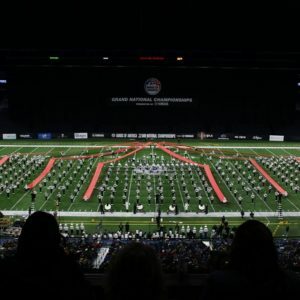 Since 1988, “Hooah” has flourished and evolved from an exclamation and motto into a nickname for the section as a whole, the individual members of the section, the instruments themselves, and so much more. Spartan Hooahs *always* wear shorts. Since 1985, and beginning with a dare between friends, the section wears shorts to every rehearsal no matter the weather. 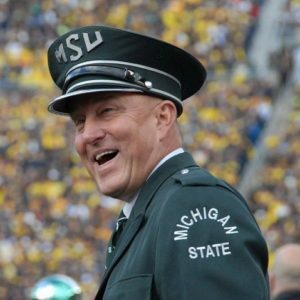 If you join the SMB for a rehearsal in late November with snow on the ground, you will certainly find the committed Spartan Hooahs sporting shorts in the bitter cold along with hats, scarves, and gloves. 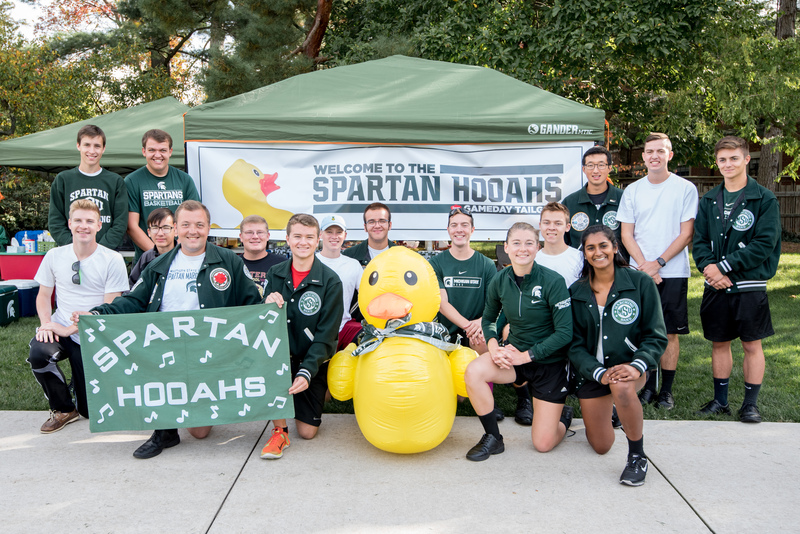 In 1996, the Spartan Hooahs adopted their beloved section mascot – the rubber duck. 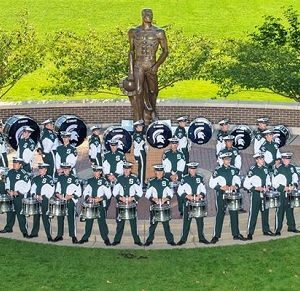 You will find a rubber duck hidden in many section photos, including the formal photos taken around Sparty during preseason. The Hooahs have a number of smaller traditions as well. 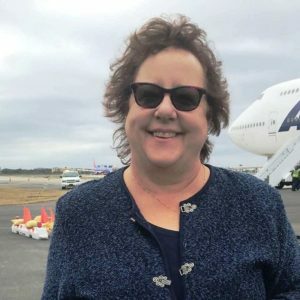 For a decade, the section has sang the song “Sailing for Adventure” from the film Muppets Treasure Island on every bus trip with the band. In 2013, the section started the popular pirate defense cheer that accompanies the drumline during football games. The pirate cheer has since spread to much of the rest band. The Hooahs also have competed annually since 2011 in the Hoo-La Cup against the Otlas (alto saxophones), a series in which the Hooahs have reigned victorious with a 5-2 overall record. Additionally, during the section’s huddle on Adams Field on gameday, the Hooahs prepare for the game ahead with their “What Makes the Grass Grow” chant, which has been a staple since 2007. The longest standing and perhaps most well-known tradition of the Spartan Baritones is Faygo! The section introduced Spartan Stadium to its rendition of the Faygo Boat Song, arranged by Matt and Andy James, in Fall 1976. Faygo, originally performed by the section during football games, would prompt the entirety of Spartan Stadium to stand, sway, and sing along. The section now performs Faygo on Adams Field as part of its gameday warm up routine. The Spartan Hooahs celebrated 40 years of Faygo in 2016 with a large gathering of alumni and a Faygo delivery truck brought from Faygo’s Detroit headquarters especially for the celebration. Each member of the section has a favorite flavor of Faygo Pop which they declare their first year in the band, the current section’s favorites are: Orange (5), Rock N’ Rye (4), Creme Soda (4), Root Beer (3), Red Pop (1), and Arctic Sun (1). 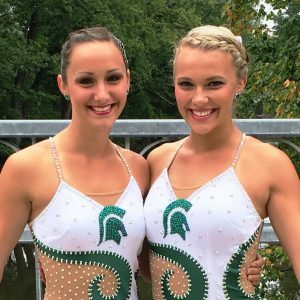 The abundance of traditions and storied history of the Spartan Hooahs make the section an incredible group to know, befriend, and be a part of. With an incredible flair for humor and a consistently positive attitude, the Hooahs are a section and a family like no other in Spartan Nation.